Last week, the Russians sent troops into Venezuela with the speculatory number being a total of 100 soldiers deployed. Auspiciously, immediately after this, the U.S. Air Force deployed six nuclear-capable B-52 bombers to Europe to send a "message to Russia," Real Clear Defense reported. The U.S. Air Force is carrying out "theater integration and flight training" out of London's RAF Fairford station, which will help prepare airmen to use the base as their forward operating location for bombers in Europe, the Air Force said last week. "Training with joint partners, allied nations and other U.S. Air Force units contributes to our ready and postured forces and enables us to build enduring and strategic relationships necessary to confront a broad range of global challenges," the Air Force said. The Kremlin accused the U.S. of escalating tensions by flying its B-52 bombers near its border. Russia's Defense Ministry further claimed it prepared two Sukhoi SU-27 fighter jets to intercept a U.S. aircraft before it changed its direction, Reuters reported. Trump administration national security adviser John Neocon Bolton threatened Russia for sending in troops into Venezuela, stating that any move to expand operations there would be considered a "direct threat" to international peace, Reuters reported. "We will consider such provocative actions as a direct threat to international peace and security in the region," Bolton added. This also came after U.S. President Donald Trump's loose-lipped statement that "Russia has to get out" of Venezuela and "all options are open" in ensuring that Russia withdraws from the socialist nation. It also followed comments just one day after Elliot Abrams, Washington's envoy to Venezuela, threatened that "the Russians will pay a price" for allegedly helping prepare the country with S-300 surface-to-air missile defense systems for combat. Other things to note: both Russia and the U.S. have pulled out of the INF Treaty which governs the two nations not using nuclear weaponry. The Intermediate-Range Nuclear Forces (INF) Treaty, banned land-based nuclear missiles in Europe during the Cold War. This followed a month after with Russia running a drill flying two of its nuclear-capable strategic Tu-160 bombers over the Caribbean Sea and Venezuela during a 10-hour training mission, presumably in response to U.S. threats to withdraw from the treaty with Russia, WSBTV reported. The U.S. claimed that Russia's 9M729 cruise missile breaches the INF treaty, Activist Post reported. Russia also tested its "Avangard" hypersonic weapons and an underwater nuclear-capable drone that Activist Post reported Putin had teased. According to military envoys, Russian authorities have made a decision (and Venezuelan President Nicolas Maduro did not object) to deploy strategic aircraft to one of Venezuela's islands in the Caribbean Sea, which has a naval base and a military airfield. Ten years ago, Russian experts and Armed Forces commanders had already visited the island of La Orchila, located 200 kilometers northeast of Caracas. Venezuelan laws prohibit the setup of military bases in the country, but a temporary deployment of warplanes is possible. "It is the right idea to include Venezuela in long-range aviation missions," military expert Colonel Shamil Gareyev told the newspaper, adding that it was also economically reasonable. "Our strategic bombers will not only not have to return to Russia every time, but also won't perform aerial refueling while on a patrol mission in the Americas. Our Tu-160 aircraft arrive to their base in Venezuela, conduct flights, execute their missions and are then replaced on a rotating basis. This is how it should be done," he said. U.S. Secretary of State Mike Pompeo responded to the past situation by stating in an angry rant that the drills were a waste of public funds. "Russia's government has sent bombers halfway around the world to Venezuela," Pompeo said on Twitter. "The Russian and Venezuelan people should see this for what it is: two corrupt governments squandering public funds, and squelching liberty and freedom while their people suffer." Russia's president Vladimir Putin issued a televised statement threatening the U.S. by stating that "Russia would build weapons previously banned under the treaty and would no longer initiate talks with the United States on any matters related to nuclear arms control." However, the country stated they would not deploy those weapons unless America did first. "I would like to draw your attention to the fact that we must not and will not let ourselves be drawn into an expensive arms race," Putin told Russian ministers. "Money to build the new missiles," he added, "will come from the existing defense budget." "Our response will be symmetrical. Our American partners announced that they are suspending their participation in the I.N.F. Treaty, and we are suspending it too. They said that they are engaged in research, development and design work, and we will do the same," Putin said. Russia appears to be making preparations for potential war. 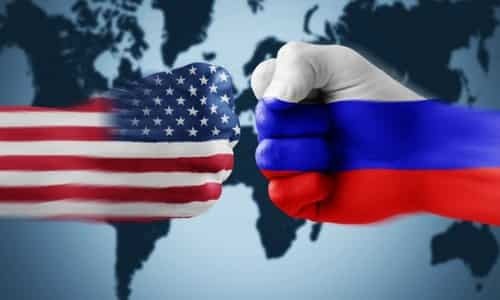 Last year, a Russian state-owned television station warned that some Americans are preparing for a coming war with Moscow, explaining to the country's residents how to stock their bunkers with water and basic necessities in case a war breaks out. "We'll finish building infrastructure in 2019 to accommodate air defense radar units and aviation guidance points on the Sredny and Wrangel Islands, and on Cape Schmidt" in the Russian Arctic, Defense Minister Sergei Shoigu said according to France 24. Activist Post previously reported that U.S. and Ukraine were in "close discussion" with Washington to supply another cache of lethal weapons for Kiev's fight in eastern Ukraine, Ukrainian Foreign Minister Pavlo Klimkin told reporters Nov. 18, a day after a meeting with U.S. Secretary of State Mike Pompeo in Washington. This came after Moscow rammed and shot at Ukrainian Navy ships allegedly for invading its territorial waters in the Kerch Strait near Crimea, hitting two vessels and injuring six crew members. The U.S. and international committee members condemned the action by Russia, "as an act of aggression" stating the country "violated international maritime law." In October, President Trump cited China's potential expansion as a reason the United States should consider quitting the INF treaty. "If Russia's doing it and if China's doing it, and we're adhering to the agreement, that's unacceptable," Trump said after a rally in Nevada. The war drums keep beating louder and louder with no signs of slowing down that growing rhythm, which if we aren't careful could lead to a global catastrophe.